The word, Princess Syndrome is actually used to describe young spoil Hong Kong girls but this princess syndrome doesn't occur in Hong Kong only but it's spreading in China and other parts of Asia countries as well. One of the example video clips of how the boyfriend being embarrassed in the public for not being "gentleman"
Guys, how far would you go for the woman you love? 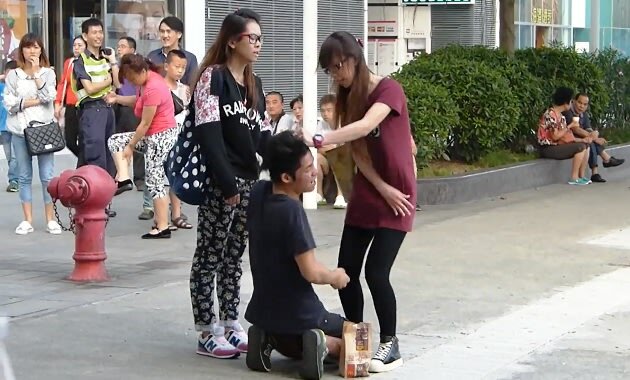 Most of you probably wouldn’t go as far as this Hong Kong man, who knelt on a street in Hong Kong and allowed himself to be slapped and berated by his girlfriend, who alleged that he had cheated on her. In a five-and-a-half-minute-long YouTube video of the shocking incident, the girlfriend (wearing a pink shirt), whom Hong Kong media reported as a 20-year-old woman called Cheng, can be seen slapping her boyfriend, 23, repeatedly (about a dozen times) and pulling his hair. She accused him of bringing a woman home. The boyfriend cried and appeared emotional as he denied his girlfriend’s allegations. However, his girlfriend did not stop the abuse. He then yelled at another woman (wearing a black shirt) in the video, who appeared to be the woman he brought home as well as a good friend of Cheng, telling her to speak up for him. However, the other woman ignored his request and just made half-hearted attempts at calming Cheng down. Cheng’s violent acts even drew criticism from bystanders, with many scolding her for her bad behaviour and calling her “ugly”. Many also urged the boyfriend to break up with her. According to Hong Kong newspaper Oriental Daily, the incident happened at around 5pm last Friday. Oriental Daily also reported that the police had arrested Cheng for assault and investigations are ongoing. Meanwhile, the victim had been conveyed to the Queen Elizabeth Hospital. The video of the incident has received over 400,000 views since it was uploaded to YouTube last Friday. Here it is below. Be warned, it contains violence and coarse language.